Caffeine is a stimulant: it can elevate heart rate and blood pressure, which mimics the fight-flight-or-freeze response. This can increase feelings of anxiety and disrupt sleep. Caffeine is found in coffee, tea, soft drinks, energy drinks, chocolate, and even some pain medications. So watch out for that sweet tea or migraine medicine, you might be taking in more caffeine than you realize. Reducing or eliminating caffeine can help with sleep. If you cannot completely eliminate it, try restricting your intake to 1-2 caffeinated beverages per day before 2pm. Although some people report using nicotine (smoking cigarettes) to relieve stress, it is actually a stimulant. It increases heart rate, blood pressure, breathing rate, and makes you feel more alert. It is also associated with serious physical health consequences. Smoking within several hours of bedtime may interfere with sleep. At the same time, heavy smokers may experience withdrawal symptoms when trying to cut back, which can also interfere with sleep. 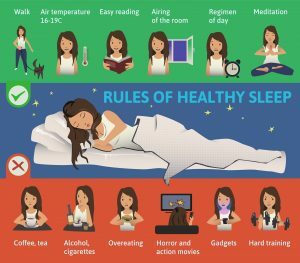 However, quitting smoking will be helpful to your sleep and health in the long run. Deciding to cut back on smoking or quit altogether is a big decision. Get support by talking to your healthcare providers about ways to help! Alcohol can make you sleepy, which is why many people with PTSD or anxiety turn to alcohol to calm down, often in an attempt to self-medicate so they can relax and go to sleep. Although it may help you initially fall asleep, alcohol prevents you from getting deep, quality sleep; resulting in you feeling as if you did not sleep at all. It also increases dreaming and nightmares. Even a small amount of alcohol as much as 6 hours before bedtime can increase wakefulness during the night. Using alcohol as a sleep aid can make the problem worse. It is especially dangerous to mix alcohol with other medications, especially sleeping pills. Exercise is helpful for sleep because it increases your metabolism. The higher your metabolism, the more your body has the need for sleep. With your doctor’s permission, try to set up a regular exercise routine that you can do early in the morning or afternoon. Exercise early in the day may help you fall asleep more quickly and stay longer in a deeper stage of sleep. It can also help over the long term with anxiety/depression as well as physical health problems. Try to avoid exercise 2-3 hours before bedtime. This activates your body and can make it harder to sleep. Having a large meal in the evening can actually make it harder to sleep at night. It makes your body work harder at night to digest the food instead of letting it rest. Try eating a smaller meal early in the evening. Avoid heavy, spicy, or high-sugar foods – these can interfere with sleep. Stop drinking fluid an hour before sleep and be sure to go to the bathroom before trying to sleep. 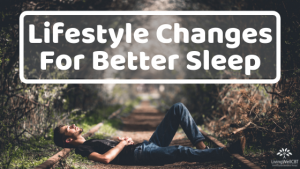 This week think about what changes you can make to increase your overall wellness and improve your sleep. If you have a lot of changes to make, do not get stuck in the overwhelm. Instead just pick one change, one thing, and break it down into one step you can make this week. Focusing on things one step at a time will help you implement changes that stick in the long run.